Peace of mind — come rain or shine, deep freeze or heat wave — that's what Evcon™ heating and cooling products offer you. From precision temperature control to exceptional product support, we’re dedicated to ensuring your comfort and satisfaction. 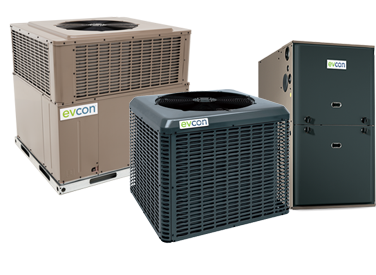 Whatever the weather brings, Evcon™ is proud to offer heat pumps, furnaces and air conditioning systems that deliver money-saving efficiency and outstanding value.